There’s no doubt about it – visitors to Indiana’s Cool North love everything Amish. The scrumptious food, intricate hand-stitched quilts, finely crafted furniture, the ever-present horse-drawn buggies, and the quiet farmsteads are truly captivating. There are many ways to get to know the Amish people, who live a lifestyle of simplicity, foregoing modern amenities such as electricity, cars and telephones. 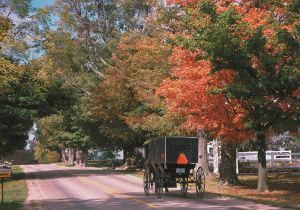 Here’s a guide for immersing yourself in all things Amish in Northern Indiana’s Elkhart and LaGrange counties – home to some 23,000 Amish residents, one of the largest Amish population in the nation. As you travel the friendly communities and quiet back roads, you’ll get plenty of chances to meet Amish people. Respect private property, but definitely take the opportunity to chat with Amish shop and business owners and artisans who welcome guests. Here are some driving courtesies to keep in mind along with some shopping information. Slow down for the horse-drawn buggies. They travel well under the speed limit, so watch especially as you crest hills and round corners. Respect the horses too – flashing headlights and car horns can startle them. Don’t ask to photograph or film the Amish because it’s against their religious beliefs. Amish businesses are closed on Sundays. Many Amish businesses do not accept credit cards but prefer doing business in cash. 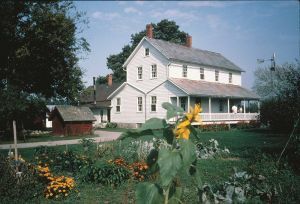 The fascinating Menno-Hof Amish-Mennonite Information Center is a great place to learn all about the Amish and closely related Mennonites, from their escape from religious persecution in Europe through their lives in modern America. Travel through five centuries as you explore a 17th century shop, replicas of an old-time sailing ship, meeting house and an Amish home. Experience the simulation of a tornado as the wind blows and the theater shakes. There are plenty of hands-on activities for the kids. A visit to Amish Acres Historic Farm & Heritage Resort, the only Olde Order Amish Farmstead listed in The National Register of Historic Places, will give you a deeper understanding of the Amish culture. Start out by viewing films that explain the Amish way of life before taking a guided tour through the homestead and farm and a wagon ride around the 80-acre grounds. Amish Acres also features a theater, restaurant, and bakery (see below under specific categories). You see horse-drawn buggies everywhere, so why not enjoy a ride yourself? 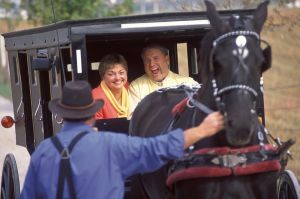 A variety of tours are available from Blue Gate Carriage Tours, Buggy Lane Tours and Miller’s Buggy Line Company, all located in Shipshewana. Amish drivers will fill you in on the area and their experiences growing up here as you clip-clop through town or the countryside. You’ll see pristine white farmsteads where laundry flaps in the breeze and colorful gardens abound. 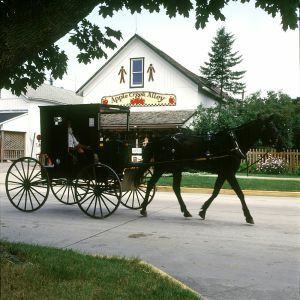 Some tours stop at shops on homesteads, Amish dairy farms and include dinner at an Amish home. History comes alive in top-notch theatrical performances that explore Amish life through stirring musicals. At the Blue Gate Theatre in Shipshewana, the newest full-length musical, Stolen, is a mystery that takes place in an Amish community, and the Christmas season will bring a heartwarming new musical, Christmas in Paradise. 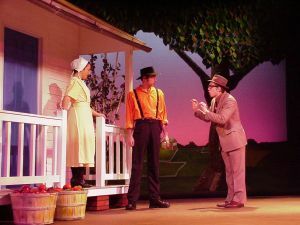 At the Round Barn Theatre, a historic venue at Amish Acres in Nappanee, Plain and Fancy, a much-loved musical that tells the Amish story beautifully, has delighted more than 300,000 theatergoers over the years. 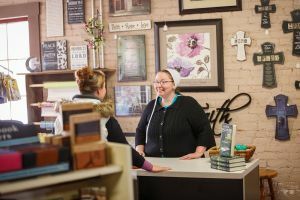 Just about everything about this busy town says “Amish,” from the horse-drawn buggies of the Amish who shop and work here to more than 100 stores, many featuring Amish-made goods. Several furniture stores sell beautiful Amish creations from cabinets to clocks. When you see the name Yoder, you’ll find goods such as meat raised on their nearby farms at their Meat & Cheese store, goods that hearken to a simpler lifestyle at their Hardware and a mix of finds at the stores in their Red Barn Shops, including the unique Amish-owned Red Bud tea store. E&S Sales is an experience in itself with hundreds of varieties of bulk foods plus a bountiful deli. Lolly’s is filled with Amish-made quilts and supplies. Just down the road a few miles from Shipshewana, the tiny town of Middlebury is home to the Essenhaus Village Shops, five specialty shops in original homestead buildings that have been refurbished. 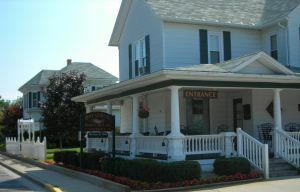 They’re filled with finds that include Amish-made quilts and furniture, inspirational books, and artworks.The shops are part of the Das Dutchman Essenhaus campus, which includes an inn, buggy rides and a restaurant (see “Dining” below). Roaming the back roads pays off in so many ways, especially if you want to get to know Amish merchants and browse among their unique creations. Shingle shops, the small stores on Amish farmsteads denoted by a sign or “shingle,” seem to emerge around every bend. On the roads outside of Shipshewana, you can make a bird house with a little help from crafters or buy one at B & L Woodcrafts. You’ll find many more shops as you journey. 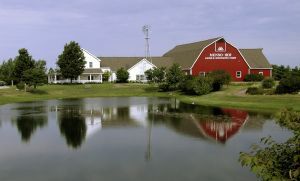 Countryside Shoppes Showcase at Coppes Commons in Nappanee displays the works of Amish crafters and other local artisans and provides you with a map that will lead you to their rural shops and other businesses in the countryside. While you’re in town, visit the varied shops within the historic Coppes Commons building many of which are Amish owned and operated . Visitors take away a true Amish experience that they’ll talk about for years to come when they take advantage of the bountiful dinners prepared by Amish families in their homes. Not only is the food amazing, but so is the hospitality. The experience gives you a chance to converse directly with Amish people and learn their stories. Visitors rave about the fried chicken, Swiss steak, noodles and fabulous rolls at Mullet’s Dining in Nappanee. Accolades abound for feasts at several other places, including Yoder’s Homestyle Cooking, where one option is to attend a class in Amish cooking before you dine. Under the hand-hewn timbers of the Restaurant Barn at Amish Acres, the Threshers Dinner feast fills you up with delicious Amish fare while paying tribute to the generations of Amish threshers who band together each harvest season helping to bring in each other’s crops. Traditional Amish food – home-baked breads, apple butter, ham, chicken, noodles, mashed potatoes and scrumptious pies – is served family-style, and the platters just keep coming. The barn was originally raised in 1870 and moved to Amish acres in 1977. You might see an Amish family or two dining at either of these popular restaurants. Portions are as generous as the hospitality at The Blue Gate Restaurant in Shipshewana, where standards such as fried chicken and beef and noodles star on the dinner menu and are a delight. And there are more than 25 kinds of pie to choose from! 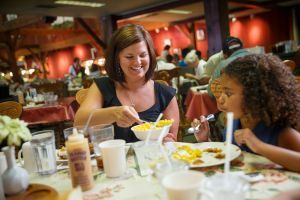 In Middlebury, Das Dutchman Essenhaus claims the title of Indiana’s largest family restaurant, seating more than 1,000. But the food is down-home Amish, featuring chicken, ham, roast beef, and more than 30 fabulous pies. Dine buffet-style, family style, or off the menu. 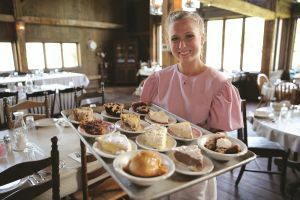 In Indiana’s Cool North, it would be a rare visitor who could leave this Amish area without delighting in a piece of from-scratch pie, fresh-from-the-oven cookies, yeasty breads, cinnamon rolls dripping with frosting and so much more. 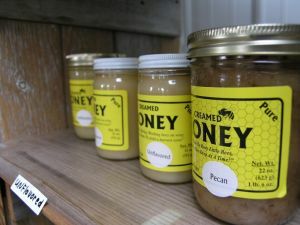 Everything is so delicious, it seems almost mandatory to take some treats back home, along with other Amish goodies – locally made jams, jellies, noodles, and Amish peanut butter. You’ll find them in many area restaurants and smaller shops such as Bread Box Bakery in Shipshewana. A true find is Country Lane Bakery, run by an Amish family and tucked along a quiet road outside of Middlebury. It’s a fitting finale for your Amish adventure.